Home politics Bouteflika resignation: Will it quell Algeria protests? Bouteflika resignation: Will it quell Algeria protests? Bouteflika’s resignation on Tuesday was a huge turnabout for the sickly 82-year-old leader, who had initially planned on running for a fifth term in elections slated for April. The prospect had triggered weeks of demonstrations by hundreds of thousands of dissatisfied Algerians. Meanwhile, the presidential vote has also been shelved. 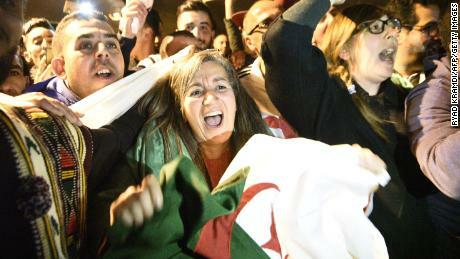 Euphoric scenes broke out in the capital of Algiers when state media carried reports that Bouteflika had ceded control with immediate effect. Men, women and children wrapped themselves in the Algerian national flag and burst into song and blared car horns on the city’s streets. Elected in 1999, Moroccan-born Bouteflika was praised during his first two five-year terms for steering the North African country back to stability following “the black decade” of the 1990s when a bloody civil war left more than 150,000 dead. Despite suffering a stroke and ongoing health problems, he was elected again in 2009 and 2014 in landslide victories, although the opposition criticized the fairness of those elections. More recently, Bouteflika has been a largely absent ruler and many Algerians have grown tired of the undemocratic rule of “le pouvoir,” or the power — as the clique of military and civilian elites propping up the former President has become known. 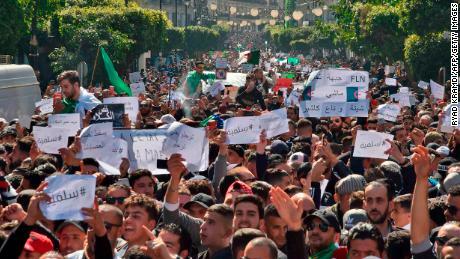 Protests against Bouteflika broke out in late February as student-led demonstrations, but as the weeks passed, public anger continued to intensify and the protests transformed into a peaceful but leaderless social movement represented by a broad cross section of the population. As the pressure mounted, even once-loyal allies of the President shifted allegiances. 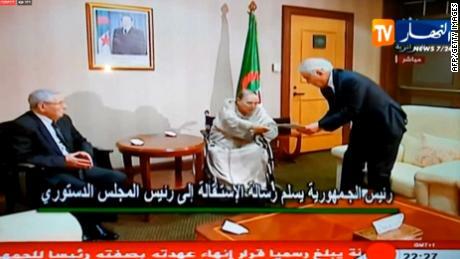 In a speech broadcast last Tuesday by private television station Ennahar, Gen. Gaïd Salah cited articles in the Algerian constitution stating that if Bouteflika’s health prevented him from carrying out his function, the presidential office must be declared vacant. For the first time in more than two decades, Algeria’s Constitutional Council convened Wednesday to declare the President’s seat “vacant,” in accordance with the country’s constitution, the Algeria Press Service (APS) reported. The Algerian Parliament then has to approve the Constitutional Council declaration. Once the parliament approves the vacancy, the speaker of Algeria’s upper house, Abdelkader Bensalah, will act as interim head of state for a maximum period of 90 days, during which a presidential election must be held. As caretaker leader, Bensalah is not eligible to put his name forward for candidacy in the upcoming elections. Will this put an end to protests? Demonstrations are fairly common in Algeria as a result of high unemployment and the country suffering a debilitating financial crisis after a collapse in oil revenues. These mass protests may have started out as anti-Bouteflika demonstrations, but have since morphed into something much bigger. As time has gone on, activists have become more emboldened and called for a more drastic overhaul of the country’s government and its leadership. So with protests against the Algerian government set to continue, the question becomes how can activists maintain the momentum of their movement? “Algerians are very realistic. This is a beautiful victory, a tangible first step but they know that more has to be done. They are not satisfied entirely … they want all of them to be gone,” explained Dalia Ghanem, an Algerian resident scholar at the Carnegie Middle East Center. Ghanem said that preparations are already underway for new large-scale demonstrations to take place on Friday and that the focus will be on continuing their peaceful appeals for change. CNN’s Nada Altaher in Abu Dhabi contributed to this report.